With a stylish front-end and an intriguing rear, the Toyota Prius Prime has to be the best looking of the of the hybrid lineup. Powered by Toyota’s 1.8-liter Atkinson-cycle 4-cylinder and a pair of permanent-magnetic synchronous AC, the Prius Prime has a combined power output of 121 hp and it’s able to cover 25 miles on electric power alone. As with the other Prius models, the Prime also makes use of a CVT-like automatic transmission to make for a smooth and easy drive. You can enter the Prius Prime world with a starting price of $27,100 for the Prime, $28,800 for the Premium and $33,100 for the Advanced. When a hybrid car that has a reputation for being quite bland sees a new model being released with the word Prime in the title, expectations rise a little. 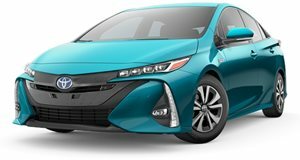 For the Toyota Prius Prime there’s a whole new look that sees changes to the bodywork and it looks decidedly more Lexus up front, there’s an impressive list of features and also an interior that looks to have taken inspiration from Elon Musk thanks to a large tablet-like screen in the center of the dash. Toyota has added three Prius Prime trims to the lineup with things starting off at $27,100 – a good price for Toyota’s most advanced hybrid to date. Cover the Toyota badge on the multifunction steering wheel and put a non-car person inside, and the dash of the Prius Plus can easily be mistaken for a Tesla but only because they have a similar focal point in the form of a large optional display screen. The Prius screen is actually 5.4-inches smaller but it’s still one of the biggest around and it’s home base to control all manner of onboard functions and systems in the hybrid car. Below that, what looks like the climate control is actually the drive selector with associated drive mode buttons and this frees up space below for storage and a wireless charging bay for your smartphone. Finishings are good with the plastics not being overly hard to the touch, and the seats come in SofTex, which is a simulated leather material, this car is about saving the planet after all. There’s ample head and legroom for four adults and trunk space at 19.8 cu-ft. The Toyota Prius Prime is fitted with a normally aspirated Atkinson-cycle 4-cylinder motor added to a pair of generators to provide the drive, and there are a few drive modes that affect how it all behaves; Normal, Eco and Power. EV Auto is best as it chooses which way the power is used, be that hybrid or full electric. Eco mode is best for mileage and the environment, but it does affect how the Prius pulls off, and it’s not great. The three motors work together to send power to the wheels using a planetary gearset that feels a lot like a continuously variable transmission. While the car isn’t going to set speed records, it’s nippy enough to stick with all manner of daily traffic and can top out at a limited 101 mph if you have the need. Steering feedback isn’t really a term associated with the car besides that when it turns, so does the car. The Toyota Prius Prime has a total of 121 hp available from three different power sources. Two of these are permanent-magnetic synchronous AC motors that produce 8 hp apiece and the main one is a normally aspirated Atkinson-cycle 4-cylinder measuring in at 1.8-liters of capacity, and this one is rated at 95 hp and 105 lb-ft of torque. In full electric mode using an 8.8-kWh lithium-ion battery pack the Prius Prime can cover up to 25 miles, while as a whole the car can return consumption figures of 55 mpg for the city, 53 mpg on the highway and 54 mpg for the combined cycle. Even with the entry trim Toyota Prius Prime Plus there’s a good amount of standard features, and as expected it gets better the more you spend. All models feature Entune Premium Audio systems in different levels of spec, the Plus has the small 7-inch screen while the Premium and Advanced both see fitment of that large 11.6-inch screen, and the top trim can be optioned with JBL components. There’s a lot more added in like remote A/C, backup camera, a 4.2-inch multi-information display and wireless smartphone charging. Safety is plentiful with enhanced vehicle stability control, traction control, ABS, electronic brake-force distribution and brake assist with Smart Stop Technology, along with front, side and knee airbags. The Toyota Prius is often called bland when it comes to looks, but with the new angles used in the styling of the Prius Prime it does look much better, attractive even. Added to the exterior looks is an upgraded interior with an available 11.6-inch screen to head up the infotainment system and all manner of driving systems too. The three-trim lineup all make use of the same hybrid powerplant seen in the other Prius models but it does employ a larger 8.8-kWh battery in the system. Pricing is good too, so if you must have a Toyota Prius, then the Prime is a great option alongside the Prius C.